Scale Stopper No-Salt Water Conditioners: Now Eliminate Scale Build-Up with No Salt. Fresh, Clean, Chlorine-Free, Scale-Free Water Throughout the House! Complete Scale Protection for Appliances, Fixtures, Water Heaters. Complete System includes Carbon Filter, Scale Stop Media, Tank with In-Out Valve & Bypass, Both 3/4" and 1" Pipe Connectors. INCLUDES SHIPPING. Better than bottled water: clean, great tasting water at every tap! "Great water, thanks for your help. Glad to get rid of my old softener. The water is no longer slippery and no sign of white build-up! The added whole house filter is nice, we are enjoying the clorine free water for drinking and in our shower." - Jim S.
"My thanks to Randy Holloway at Clean Water Stores, Santa Cruz CA, for his unending patience with this very inquisitive customer. Although my issues in purchasing and installing my Scale Stopper 4.0 unit, and associated components may have been somewhat minor in terms of some water problems around the country, Randy continued to promptly answer my questions, and contribute to my faith that I had made the right decision in purchasing from Clean Water Stores, Inc. So far, so good, after just a few days of operation. No regrets. Thanks Randy!" - Bob A. A recent development, Template Assisted Crystallization (TAC) has produced the first effective chemical-free scale prevention method. 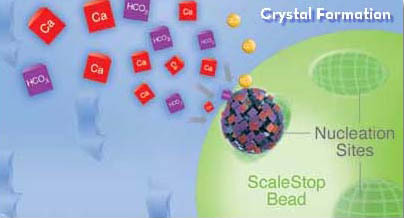 Based on TAC technology, Scale Stopper converts hardness minerals into harmless, inactive microscopic crystals. Tested by an independent laboratory against the international protocol for scale prevention, Scale Stopper achieved a 99.6% effectiveness rating - the only technology to do so and far more effective than any other water softener alternative. Proven in over 7 years of successful use in homes and businesses. - Complete protection from scale for boilers,water heaters and more. - No salt, chemicals or electricity required. - No backwash water waste. - Long lasting media-not consumed by the reactions. - Environmentally friendly-great fit for corporate Green programs or initiatives. 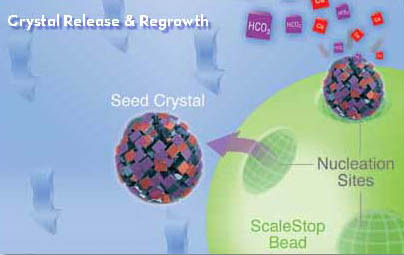 Atomic sized nucleation sites on the surface of small polymer beads convert dissolved hardness into microscopic crystals. Once the crystals grow to a certain size they are released from the bead. The crystals in solution keep the hardness out of the water so that it can't form scale or interfere with soap. Crystal photo taken with a Scanning Electron Microscope. 3.0 1 - 2 12 GPM Diameter: 8"
4.0 2.5 - 3 16 GPM Diameter: 9"
5.0 4 - 6 20 GPM Diameter: 10"
7.5 Commercial 30 GPM Diameter: 12"
Note: The 4.0 Liter model works best for most homes ( such as 2 -3 bathroom homes with 2 - 6 persons).